Bruce Anderson is having a lot of fun on the track these days. 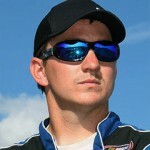 With a solid string of finishes in the NASCAR Whelen All American Series Late Model Stock Car Division at South Boston Speedway, the South Boston native is consistently bringing the PHCC Patriots Race Team to the top ten finishers during the 2013 season. On July 19, 2014, in the Century Link 100 race at South Boston Speedway he brought our team home another first place win.